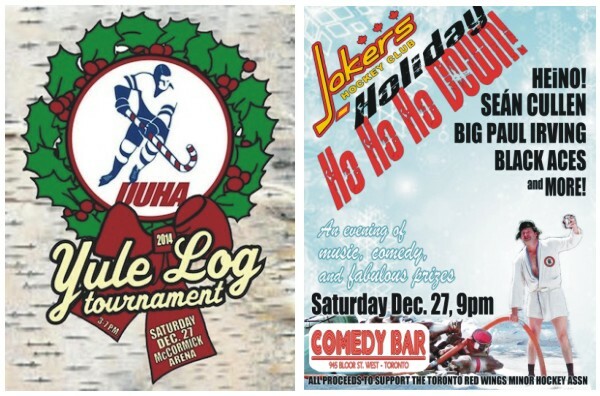 TORONTO - The annual Yule Log Tournament and the inaugural Jokers Holiday Ho Ho Ho Down are set to challenge Christmas for best-day-of-the-year honours. By sheer coincidence, the two UUHA-related events will take place on the same calendar day this holiday season, namely Saturday, Dec. 27. The Yule Log (which, by the way, still has a couple of available spots for interested skaters) takes place at McCormick Arena starting at 3:00 PM and wraps up at 7:00 PM. That event will feature three mixed and balanced teams comprised primarily of players from UUHA teams competing against each other for the revered and time-honoured Yule Log Championship (the tourney is in its sixth year.) The Jokers Holiday Ho Ho Ho Down, which features appearances by Sean Cullen, Heino, the Black Aces, Big Paul Irving and others, takes place later that evening at The Comedy Bar on Bloor St. West. Doors for that benefit event are at 9:00 PM.